Image: the Holy Sepulchre in Jerusalem. I think of the autism community as being in one building, but with many different beliefs. I almost see the autism community as a whole almost being as divided as the people controlling the Holy Sepulchre. It's a holy site in Jerusalem that is controlled by six churches: Eastern Orthodox, Armenian Apostolic, Roman Catholic, Ethiopian Orthodox, Syrian Orthodox and Coptic Orthodox. As you well may know, it's not all peace and love in Jerusalem, despite the fact the city is known to be amongst the holiest of holy places. Fights at the Holy Sepulchre happen occasionally and it is often pointed out that while these fights occur the building itself falls into disrepair. Fortunately, in the world of autism the fights tend to be more verbal than anything but as we all know words can hurt a lot. The good news is that most people in our community have the similar interest of being concerned for the well being of a person with autism. The bad news is that is often the only similarity. Unfortunately some people (especially in my part of the world where the word about autism is just getting out) are quite unaware as to what the different ideologies are. Hence, unknowingly, they can inadvertently offend and thus step on a 'virtual' landmine by making a comment or expressing an opinion about the following topics (that include, but are not exclusive to): vaccines, high or low functioning autism, puzzle pieces as a symbol for autism, and certain biomedical treatments. I've seen people argue or post views about all these topics. Some people merely state their opinions, while others fully intend to be provocative. Mostly I think blogs are safe places to air personal views. Some blogs, more than others, generate comments from people who disagree with the main point(s). Recently I've been a witness as to just how much a unsolicited personal opinion can offend. This opinion caused some distress amongst some recipients because of an adherence to an opposing point of view. During the said recent occurrence, I left one bristling at some statements made in a mass email. Being born into an era where we are taught to accept multi-diversity and multi-culturalism, I believe in respecting most beliefs despite the religion. I also want people to respect my own thoughts, opinions and beliefs. I feel as long as the belief doesn't cause harm to others, then there is no point in being biased against someone embracing a different philosophy than one's own. However, being human, I cannot avoid bias--either being biased or being confronted with the bias of other people. The challenge with bias arises, I suppose, when a person or group gets a little too loud while preaching certain beliefs. When this happens someone on the other side is bound to get offended and then you find "the game" beginning. The offended goes into offence mode and in response, the offending party often goes into defense mode and so on. Oftentimes there is no winner and thus no positive outcome. One negative outcome that can occur is that a great deal of time can go into the fighting and not so much into helping the community of families who face the challenges or even the person in your home who may need help in facing a certain obstacle. The offender and/or defender may also find themselves with one less friend at the end of the battle and that is something that just seems sad and avoidable. As some of you know, I've been writing from the perspective of something that happened on the home front. I was among a small group of people that was offended by a strongly worded message about both vaccines and high functioning autism. I tried my best to behave but had some not-so-pretty human moments behind the scenes. My wounds are now healing and the offenses are behind me. I'm also glad to say that the message writer is still a friend, despite having a different belief. Scarlett (O'Hara) Butler: "Oh, Ashley, when will you stop seeing both sides of questions?" she asked. But she did not speak impatiently as she once would have done. "No one ever gets anywhere seeing both sides." Ashley Wilkes: "That's true but-- Scarlett, just where do you want to get? I've often wondered. You see, I never wanted to get anywhere at all. I've only wanted to be myself." My thoughts: Margaret Mitchell's fictional character Scarlett, the main character of Gone with the Wind, can be admired for her feisty spirit, her determination and her grit. Like Scarlett, there are a lot of bloggers in the autism community out there who are feisty. They aren't afraid to take a side on the vaccine issue, or another controversial topic that exists withing the world of autism. They've chosen their side and it would take quite the suavy tongue or pen to persuade them to change their views. On the other side there are bloggers a bit like Ashley Wilkes; dreamers like me who just want to be themselves and maybe ignore the larger concerns. In the early days of my blog I did touch on the vaccine issue some, but turned away from the topic out of dismay and disgust of the controversy that existed. Unlike Ashely, however, I did choose a direction, a positive one. I wished to stay away from most negative topics. I started to write about family life and offer up book reviews and tips about handling meltdowns, etc. Generally I consider myself open minded regarding most of the controversial issues, but do at times get riled up when I feel like someone is trying to cram their personal belief down my throat. If I try to see things from another person's point of view, I expect the other person to try to see things from my own perspective. As you may well know, it doesn't always work that way and it can be frustrating when a person is so stuck on their own views that they just don't try to listen. Scarlett saw seeing both sides of a story or issue as a futile endeavor. I, however, see it as potentially helpful. It's good to know where someone is coming from as the knowledge can help one be more diplomatic during disputes. It's also good to know both sides of an issue in order to make an educated decision about what side of an issue to take. I find that it is definitely easier to see both sides of an issue than to try to change the mind of someone who already firmly believes something. So maybe that's why I haven't written about the da*m vaccine issue recently. Unlike Scarlett I see the futility in taking a side. Most people reading about vaccines already know the issue pretty well, so what I'd have to offer would not be that new to them. I imagine the only thing that would happen is that people who agreed with me would offer positive comments while those who didn't would offer up negative ones. Of course, seeing the other side of things as I tend to do, it could be interesting to return to the topic of vaccines. It has been quiet around at this blog lately. I wondering about the possibility of potential readers prefering to hang around a opinionated Scarlett rather than a feminine version of Ashley Wilkes. I do have a little bit of Scarlett buried in me way down deep. Should I bring her to the surface? Would it make this blog more interesting? What do you think? Image: This is what the phones at WCMU in Mt. Pleasant looked like except the one I answered was dark brown and had a large red light covered with a white cage that stuck out on the right side of the telephone. The flashing light indicated when someone was on the other end of the line. Autism is a topic near and dear to my heart. I have a ten year old son with ASD and and over the years have formed various opinions about nearly every sub-topic regarding this subject. No, I'm not going to quit blogging! This post is about how I temporarily and with great difficulty jumped off the soapbox last Thursday. During that evening, I was one of three volunteers answering the telephones for our local public television station's program "Ask the Specialist." The topic of the evening was autism. Two guests appeared with a professional moderator who asked the questions. The primary guest was a female 40-something psychologist with a doctorate degree from Midland, a Michigan city three dozen or so miles east of Mt. Pleasant. I had never met her before that night. My experience volunteering at the television station was both fun and unfun at the same time. The fun part was being behind the scenes of a live television show. I liked seeing the female college students behind the cameras while knowing the older, male producer was actually in a gadget filled bus next to the building. I liked checking out my surroundings. The set was simple, but professional looking with a dark blue background imprinted with the WCMU logo, a chair for the moderator, a coffee table with lamp, and a leather love seat for the two guests. The unfun part was having to witness once again at how divided the autism community is about certain issues. It was also not fun not being able to argue against some of ideas that came forth. I disagreed with a few. My job was not to spout opinions or beliefs, but to follow a provided script and write down the questions coming in from callers living in the Central and Northwest part of Michigan. I was also supposed to ask if callers were interested in an information packet and then write down their addresses. I don't know how I did it, but I did and yes, I am feeling relieved that I don't have to berate myself for offering up my unwelcome opinions. Anyway, the need to stay away from my beloved soapbox was there the moment I stepped into the door of the television station. We met in a small conference room a half hour before the thirty-minute show began at 8 p.m. Since it was a professional setting, I dressed up a little bit, hoping to make a good impression as a representative of CMASA. The two guests sat closest to the female moderator while us telephone volunteers sat further down. The moderator asked what the most relevant topics regarding autism were. After I few minutes I realized I was leaning forward ready to air my opinions. Once I was conscious of what I was doing (thankfully before I said anything) it occurred to me that the moderator really only wanted the opinions of her two guests. So I sat back in my chair and listened, pretty much in agreement with everything that was said at that time. I was being a good little volunteer, remembering exactly what I was supposed to do at that time. Being a good volunteer, however, became somewhat difficult while listening to the questions being answered on air. When the psychologist answered a certain question that I thought deserved a much better answer, it was all I could do to avoid leaping out of my seat and onto the set. I noticed my friend, the ASM vice president, had also tensed up a bit in response to the answer, but unfortunately she didn't really get the opportunity to provide a better answer. 'No', I thought. 'It really isn't good to send a mom concerned about her two year old to a family doctor. The schools, or at least community mental health are the best places to go.' In Michigan there are still doctors that are not up to date and are more or less incapable of identifying autism. But there was nothing I could do. So I sat there waiting for the light of my phone to start blinking red. I was at the third phone (the least busiest) so I only had about three or four calls. All but one of my requests were easy enough to handle. The real challenge for me came at the very end of the show when I had to grit my teeth and stay focused on the job. When the most irritating of the calls came, I realized there was a only minute left to go on the show (there was a guy holding up a placard), though I don't think the caller knew that. The voice on the phone sounded like a young adult female, perhaps another mom. Despite sounding youthful, she also sounded pretty opinionated. "Please have them address the concern," she asked me , "that the mom concerned about her two year old should contact Wic and Early On " Because I agreed with her, I was more than happy to write that down despite the time issue. However, my feeling about her call changed when she requested that I relate another concern of hers. This was the concern that irritated me. Actually I think it was the tone she used (that of an expert) while she aired her concern that irritated me. I cannot remember how she phrased it, but her tone was authoritative. She wanted me to let the specialists know that a study "proved" that vaccines caused autism. I wanted to tell her that not only was she calling too late, but that I read plenty of other studies "proving' both sides of the controversy. Instead I had to clinch my teeth shut and focus. I suppose I sounded strained, but am hoping I was polite enough--as should be expected from a volunteer. I wrote down her concern, assured her it would be handed over, and then asked her where she was from and if she wanted the information packet. She politely told me no she did not wish to receive a packet. The runner from WCMU who was supposed to sift through the questions handed to her and give them to the moderator took my paper from me, looked at it but did not hand it to the questionner. So, if I weren't so diligently blogging about this now, this incident would have only been known by the two of us besides the actual caller. I'm not sure why I was so irritated by the caller. It was probably the expert tone she used. But maybe, it was also because I was jealous that she was so obviously on the soapbox that I was trying so hard to stay away from. My point of this post is that, whether I liked it or not, this caller had a large part of influencing me to not feel good while completing my brief volunteer position. Instead, I left the television station feeling like the controversies (especially the vaccine issue) surrounding autism were and are choking the air--even here in Mt. Pleasant, Michigan. I'm not sure I've mentioned this recently, but as a volunteer for the cause of autism I've become burned out. To keep my stress down, up until this point, I've avoided blogging about controversial topics such as vaccines. After last Thursday, however, I can no longer hold back and keep quiet. I'm running back to that soap box with a fury and a fire that seems to have re lit within me. That said, some of my future posts may be a little bit edgier than they have in the past although I still hope to bring critical thinking skills and the ability to look at issues from both sides to autism-blog.net. I also am intending to continue to write the neutral, friendly posts that have made up the bulk of my posts to date. P.S. For those of you who are not quite sure what a soap box is, please check out this link. The two people answering the question at the Yahoo website did a great job explaining the meaning of the expression. On Sunday, April 19, the local chapter of Active Minds, a university student group dedicated to educating and advocating about mental health, is hosting National Stress out Day. A member of the group assured me that families in the autism community are welcome to attend. The event will be held on the mall in front of Warriner hall (pictured above) at Central Michigan University from 1-3 p.m. Hopefully the day will be as beautiful as the day the above photo was taken. We could use some great weather about now! Stressed out??? 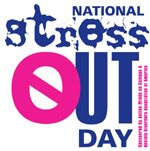 This is the perfect event to help you relax, chill out, and enjoy the beautiful Spring weather!There will be fun stress relieving activities such as: massages, stress ball making (aka fidgets), bubbles, NIA dancing, caricatures drawings, sidewalk chalk, refreshments, and stress relief goody bags! Everything is FREE!! Feel free to bring friends and family! While my chapter is directly involved with two events this month, there are other events going on in the Central Michigan area. The good news is there are two great events on one day. The bad news is that there are two events on the same day, April 25. On that day, April 25, Everyone Together, a group advocating for inclusion in schools will host the Celebrating Diverse Abilities Walk and Concert. The Walk will start at 3 p.m. by Alma's Public Library and wind its way downtown and return along the Riverwalk to the amphitheater outside the Library. (Rain location is the Library's Community Room.) Around 4:00, hotdogs and drinks will be served. At that time there will be a concert by Peter Leidy (a musician from Wisconsin who sings about disabilities and inclusion) and warm-up band All Spectrums are Circles (from Canada). As well as the concert, there will be a dance performance by the Everyone Together Kids, who are looking for dancers (of any ability) to join them for a dance called "Together" (music by Kaleidoscope, choreography by event chairperson Sheryle Dixon). Everyone Together Gratiot County will also be hosting another movie night on May 8 at Winding Brook Conference Center from 6:30 to 8:30 pm. The featured film will be Autism: The Musical followed by a discussion with parents of children with autism. About musician Peter Leidi (from his website): "Peter Leidy has been learning from people with developmental disabilities since 1983. He worked for Options in Community Living, a supported living agency in Madison, Wisconsin, from 1985 - 2004. He believes community is for everyone." I thought I might have fell into a meltdown trap when I asked my older son (the one with Autism Spectrum Disorder) to choose Happy Easter by Kurt Wiese for his bedtime story choice. It was the only Easter book in sight and I was in the mood to read it to my guys. It is a cute little story about the eggs the Easter Bunny's children collect so that the E.B. can color and deliver them in time for Easter Morning. Anyway my little guy (the one without ASD) protested and hurriedly chose that book while his big brother was brushing his teeth. I expected a fight with screams and demands coming from both boys. What I received was cooperation and respect. The little one helped me dig through our book reserves to find another book. He came up with The Little Golden Egg Book by Margaret Wise Brown. It's about a little bunny who becomes best buddies with a little chick which hatches from an egg he found. To my utmost relief the brothers in my own home were also in buddy mode. They both agreed that The Golden Egg Book was a good second book to read the night before Easter. Note: I didn't think that The Golden Egg Book, while very spring-like with a hatched egg and a bunny, could be counted as an Easter book. Imagine my surprise when I found it was #7 on a list of ten for best Easter Books. When I told my little one about my discovery he used the ole 'mom line' of "I told you so!!" This list, by the way, has some selections worth checking out. It has Easter books based on the biblical story as well as books about the Easter Bunny, etc. Family Fun Night, Friday April 17, 6-7:30 pm, Lake Michigan Room (on the upper level of the University Center at CMU). The Student Council for Exceptional Children (SCEC) will be organizing activities and helping out with the children for this event. Mini Resource Fair, Saturday, April 25, 10:30 a.m. to 5 p.m., Veteran’s Memorial Library, Mt. Pleasant, MI, sponsored by the Autism Society of Michigan (ASM) and Central Michigan Autism Society of America (CMASA). Exhibitors to be represented are recreational, educational, community providers, state agencies, advocacy groups, therapists, adult resources, camps, schools, transitional programs, consultants and food including allergen free. There will also be an IEP Help Desk and a Rummage Sale which will include home items, books, and resources on sale for reduced prices. Note: We still need volunteers for the April 25 resource fair. If there is anyone out there in the Central Michigan area who would like to help out us out, please email me at julielorenzen[put in at sign here]hotmail.com and I will give you a list of possible duties. Thanks! My Thoughts: Last April I was 'sprinting' to help with the Central Michigan Autism Society of America's (CMASA) chapter autism awareness month activities. We had a whopping nine events on our 2008 calendar. By the end of the month the rest of the committee and I were burned out on autism advocacy. This year I'm just 'jogging' at a comfortable pace because we scaled back to a more sensible calendar of two events. We also teamed up with two different groups--each of which has been responsible for organizing their respective event. So here is a huge thank you from the secretary of CMASA to the CMU chapter of the Student Council of Exceptional Children for helping us out with family fun night and to ASM for helping us with the mini-resource fair. Today is the 2nd annual World Autism Day. I found an article that focuses on autism in China. As we know, autism is a worldwide phenomenon. Families with autism face similar difficulties no matter where they live. These difficulties include, a lack of adequate resources (especially in rural areas), a lack of opportunities for adults, acceptance, and a lack of support for parents. "For decades, autism went largely undiagnosed in China even as in the West awareness was growing of the condition. China only recognised autism as a disability in 2006. "Autism is very unknown in China. If you ask people on the street, 90 percent of them have never heard of it," said Tian Huiping, the founder of China's pioneering school for autism, Stars and Rain, in the suburbs of Beijing. My thoughts: If you read to the end of the article you will find that the founder of the said pioneering school for autism is the mother of a son with autism. I find that interesting, because I'm finding it common that a mother of a child with autism will create a much needed resource in her community. See here for an example. Also, I also was interested in China's cultural aspect of the younger generation caring for aging parents. In families with a child with autism this is not probable (especially with China's infamous one-child rule). Instead these parents face the world-wide problem of not being able to find good homes/opportunities for their adult children with autism and may have to care for their offspring as they become elderly. P.S. Here is my World Autism Day post from last year. Essay: To Fool, be Fooled or not to be Fooled? Today I almost wish I lived in some far off place instead of the Midwestern part of the United States because in some parts of the world April Fools Day (today, April 1) is not practiced. In other parts of the world, tricks are only traditionally practiced before noon, and anyone playing tricks after that time is considered to be the fool. I can handle a morning of trickery. I am not sure I'm up for a day of it as I'm typing this up in the morning of April 1. The bad news is that April Fools Day can be a hey day for bullies, who may opt for cruel pranks rather than merely funny ones. People with autism or Asperger's Syndrome (AS) could be easy targets. Fortunately I do not have any horror stories to share. Unfortunately, I'm sure there is someone out there who does. On the other hand, someone with autism or AS might have to learn the hard way by playing a socially unacceptable joke on someone. I can see this happening rather easily and can only hope the consequences will not be too dire. April Fools Day can be fun and I hope everyone out there enjoys this funky day. That said, just remember not to believe any wild stories on the web or elsewhere because they are most likely to be hoaxes. Oh well, please share them with me anyway. Horror stories or links to good April Fools Day hoaxes are welcome too. Have a fun and safe day. Update: I changed my profile back to normal on April 2.